The Jesuit Juan de Mariana (1535-1624) is one of the most misunderstood authors in the history of political thought. His treatise De rege et regis institutione libri tres (1599) is dedicated to Philip III of Spain. It was to present the principles of statecraft by which the young king was to abide. Yet soon after its publication, Catholic and Calvinist politiques in France started branding Mariana a regicide. De rege was said to empower the private individual to kill a legitimate king. Its 'pernicious doctrines' were blamed for the murder of Henry IV in 1610, and it was burned at the order of the parlement of Paris. Modern historians have tended to build on this interpretation and consider De rege a stepping stone towards modern pluralist and democratic thought. Nothing could be further from the truth. The notion of Mariana as an uncompromising theorist of resistance is in fact based on the distorted reading of a few select sentences from the first book of the treatise. This study offers a radical departure from the old view of Mariana as an early modern constitutionalist thinker and advocate of regicide. Thorough analysis of the text as a whole reveals him to be a shrewd and creative operator of political language as well as a champion of the church and bishops of Castile. The argument as a whole is informed by a Catholic-Augustinian view of human nature. Mariana's bleak, at times downright cynical view of man imparts focus and coherence to a text that challenges well established terminological boundaries and political discourses. In the first instance, his deeply pessimistic appraisal of human virtue justifies his disregard of positive law. He is thus able to mould diverse elements extracted from Roman and canon law, scholastic theology and humanist literature into a deliberately equivocal discourse of reason of state. Finally, this secular interpretation of the world of politics is cleverly yoked to a thoroughly clerical agenda of reform. In fact, reason of state is made to propagate an episcopal monarchy. De rege is exceptional in that it strings together a curious scholastic theory of the origins of society, a conservative ideology of absolute monarchy and a breathtakingly radical vision of theocratic renewal of Spanish government and society. 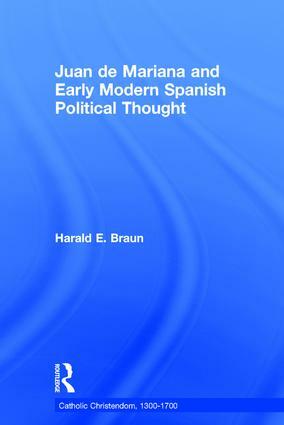 Juan de Mariana and Early Modern Political Thought elucidates the differentiated nature of political debate in Habsburg Spain. It confirms the complexity of Spanish political life in the later sixteenth and early seventeenth century. Complementing recent work on Catholic political thought, the European reception of Machiavelli, and Spanish Habsburg government, this study offers a more complete and holistic picture of early modern Spanish political culture. Harald E. Braun is Lecturer in European History in the Department of History, University of Liverpool, UK.